ECR15412BL : Ecr4kids Ecr4kids 12" Resin School Stack Chair - Four-Legged Base - Blue - Polypropylene Resin, Plastic - 12. 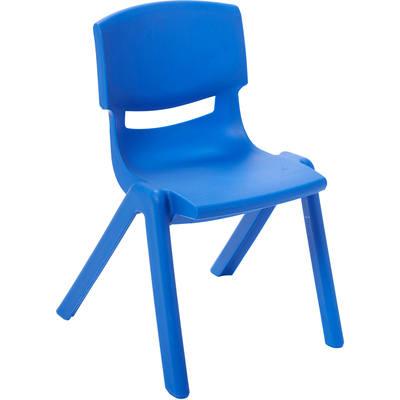 Ecr4kids 12" Resin School Stack Chair - Four-Legged Base - Blue - Polypropylene Resin, Plastic - 12. Chairs In A Cheerful Primary Color Will Brighten Up Your Classroom, Playroom Or Outdoor Space. Comfortable And Sturdy, These Resin Chairs With A 12" Seat Height Accommodate Children From Age 3 To 7 Years. Complementary Colors Mix And Match To Coordinate With Ecr4kids Resin Tables (Sold Separately). Chairs Are Easy To Clean And Sanitize So They Are A Classroom Favorite. One-Piece Design Requires No Hardware Or Tightening. Fade-Resistant Polypropylene Won'T Chip Or Peel. Stackable Chairs Feature Rounded Edges For Safety And A Slot In The Back For Venting. They Stack Six High For Compact Storage.. Chairs In A Cheerful Primary Color Will Brighten Up Your Classroom, Playroom Or Outdoor Space. Comfortable And Sturdy, These Resin Chairs With A 12" Seat Height Accommodate Children From Age 3 To 7 Years. Complementary Colors Mix And Match To Coordinate With Ecr4kids Resin Tables (Sold Separately). Chairs Are Easy To Clean And Sanitize So They Are A Classroom Favorite. One-Piece Design Requires No Hardware Or Tightening. Fade-Resistant Polypropylene Won'T Chip Or Peel. Stackable Chairs Feature Rounded Edges For Safety And A Slot In The Back For Venting. They Stack Six High For Compact Storage.